Ms. Mutia is an early career scientist in the field of Physical Oceanography. 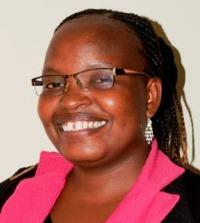 She holds a Bachelor of Science Degree in Physics from the Jomo Kenyatta University of Agriculture and Technology. Her main research interests are operational oceanography, Ocean Modelling, Instrumentation and research cruises. As part of building her career, she has enrolled and participated in both National and international training in the Field of Physical Oceanography. She is passionate about ocean observations to understand the ocean circulation and heat budgets.